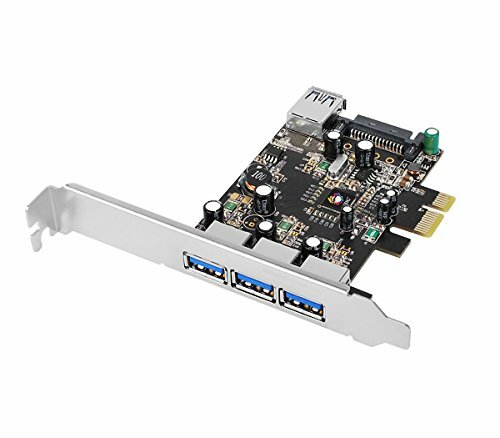 SIIG’s DP USB 3.0 4-Port PCIe i/e VL is a high performance adapter card instantly adds four USB 3.0 ports (3 external & 1 internal) to your PCIe-enabled desktop computer, immediately enhancing your existing system’s capability with the latest USB 3.0 technology. It delivers ultra-fast USB 3.0 data transfer rates of up to 5Gb/s to connect a wide variety of high-bandwidth USB 3.0 devices such as external hard disks, high resolution webcam, video surveillance cameras, digital video cameras, multi-channel audio and more. And it is backward compatible with USB 2.0/1.1 devices. With the included spare bracket, this dual-profile adapter can work with full height and low profile chassis system, providing the utmost flexibility in system chassis installation. Broad Compatibility: Windows 10 (32-/64-bit) / 8.x (32-/64-bit) / 7 (32-/64-bit) / Vista (32-/64-bit) / XP (32-/64-bit); Backward Compatible: works great with USB 2.0 & 1.1 devices. Works with high-bandwidth USB 3.0 devices, such as external hard disks, high resolution webcam, video surveillance cameras, digital video cameras, multi-channel audio and more. Dual Profile Design: using the included brackets to work with full height and low profile chassis. Compliant with: USB 3.0 specification and PCI Express Base Specification, Revision 2.0. Supports per port over-current protection.